Before creating a thread here then please read [FOR TECH SUPPORT] README FIRST. When you create a new thread then please make sure you use the "Tukui Tech Support" post template. See the link above for more information. 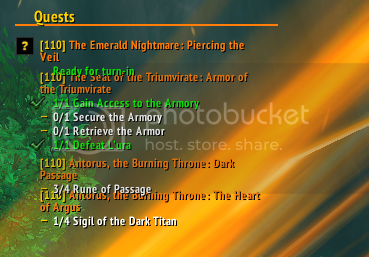 There's an issue where the Quest Tracker overlaps the World Quest tracker, and they do not appear to be seperable. Resetting TukUI (or removing the SavedVariables files) does not resolve it, but reverting to a build <= de24a0f1 does. Don't commit on master when drunk. Yup it's good now, tyvm. Appreciate all the time and effort that goes into this mod. I've updated the UI, and I'm still having the issue. A screenshot would be appreciated. Also, did you try with just Tukui enabled? This should not happen unless another addon is messing with Objective Tracker. - Post it here with status window open. Note: If "/tukui status" doesn't show anything, reinstall Tukui, because it was added just earlier today. This command will help me a lot with all future discovered bugs. Sorry but the /tukui status doesn't seem to work at all for me. I actually had put in the newest version before I logged on today as I have been trying to also figure out why my druid stance bar has a greenish looking overlay on it. I also tried with only tuk ui enabled for addons the quest log is the same and the status command still did not work for me. Brother also uses tuk so i asked him to try the status command didn't work for him either. also has an up to date version. Another thing that seems to be happening is that "Quests" and "World Quests" for the tracker pop up over the world map. Tukz, on Git I posted something similar when using a different font for Maxui Beta. The quest title is longer than 1 line. 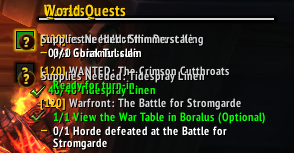 It pushes the last words of the title to a second line of text The next quest doesn't account for the double lined quest title of the previous and starts to overlap the previous quest. On GIT you gave me a small piece of code that creates a space between quests. This helped me. It makes the log visually longer and somewhat empty at titmes though. If it doesn’t show then you didn’t reinstalled Tukui as instructed. Sometime I push a new download even if the version is not bump. So yeah, you are not running latest Tukui if the command don’t show anything. Also when you provide other issue, please provide screenshot.